T-L Photo/KIM NORTH MARTINS FERRY third baseman Jaden Stalder throws to first for an out Wednesday night during the Purple Riders game against Steubenville. Big Red won, 9-3. MARTINS FERRY — If you didn’t know who won the Steubenville at Martins Ferry softball game Wednesday night, you sure couldn’t tell it by either head coach’s postgame comments. Big Red improved to 8-2 with a 9-3 wire-to-wire decision over the homestanding Purple Riders on the Rider Little League Baseball Field high atop the Purple City. However, veteran head coach Gus DiMarzio certainly wasn’t pleased following the victory. However, when you bang out 14 hits you can afford a mistake or two. “I was hoping a letdown didn’t come, but we’ve been playing pretty well,” Martins Ferry head coach Paige Williams said as her team’s 6-game winning streak came to a screeching halt. “You can’t have that many mental mistakes against a team like Steubenville because they will make you pay for your mistakes. Madison Fields singled three times, hit a solo homer in the sixth and picked up the win in relief of Stef Blackburn. 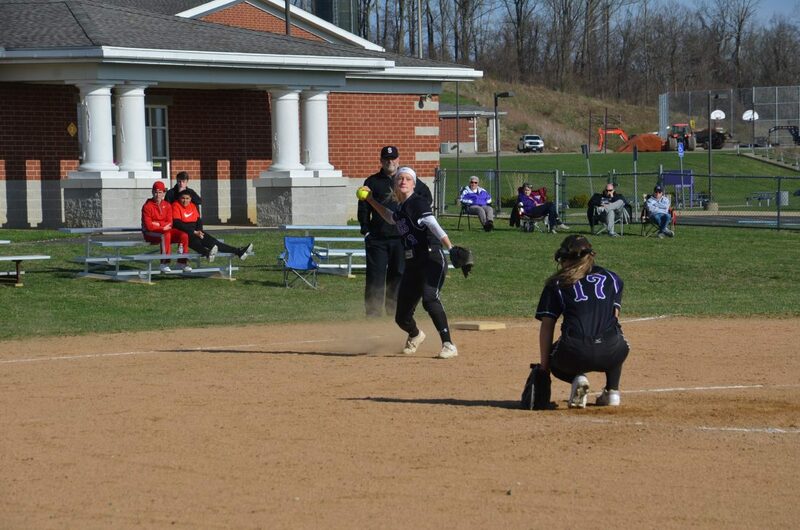 Mary Marshall doubled to right-center to knock in two runs in the top of the first and Raven Banks followed with a run-scoring single through the hole at short as Steubenville jumped out to a 3-0 lead. Sammy Cucarese made it 4-0 in the second with an RBI single. The Purple Riders (8-3) got one run back in the second on Jaden Stalder’s sacrifice fly that scored courtesy runner Kara Kapiskosky who took over on the basepaths after Hunter Pollock doubled to deep right. A 3-run fourth gave Big Red some breathing room. Lakyn Blackburn singled in a pair and Banks drew a bases-loaded walk as the margin increased to 7-1. Pollock made it 7-3 in the bottom of the inning when she cleared the fence in right-center with a runner aboard. Sammy Cucarese picked up an RBI with a groundout in the fifth before Fields completed the scoring in the sixth. “We just need to put this game behind us and get ready for the next one,” Williams added. Martins Ferry hosts Harrison Central in a key Buckeye 8 contest Friday. On Saturday, it welcomes Weir for a noon doubleheader.